In no arabic country did I ever hear from Red Lentil Hommos but while preparing a soup it cooked too long and was too thick to dilute again. We tried it as a breadspread dip without adding tahini paste. Surprisingly it did turn out very well. 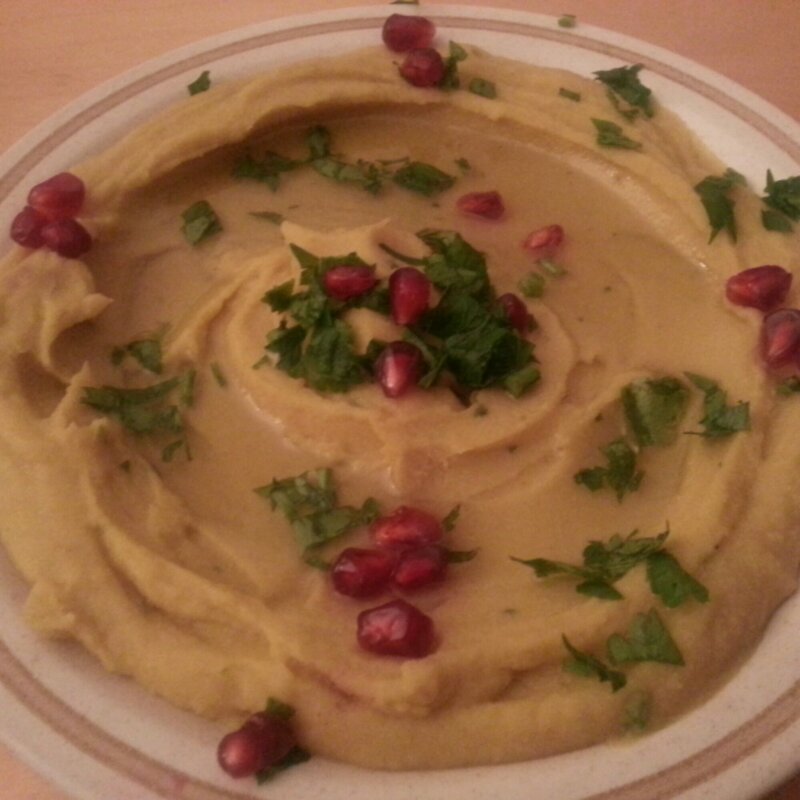 Its somewhat yellow color can be made by sprinkling a little curcuma and mixing all together (optional) With parsley and pomgrenade pieces decorated it looked like chickpea dip aka Hommos. Now it will be from now on our own vegan red lentil Hommos. Boil red lentils add cumin and curcuma, and cook until water dried out. When it’s still corny, use a hand mixer to smooth add the other ingredients. Decorate as you please. Best served with olive oil to dip. You are free to try it with tahini and tell me how it turns out. I am pretty happy about the fact that I can look up any recipe on the Internet to cook up a recipe that comes into my head, once there is nobody around to ask else. Today it was about making chickpeas puree also known as Hommos and I just felt lucky to see this lebanese blog which explains precisely with helpful pictures attached how to make it from scratch. It is considered one of the popular appetizers for breakfast or dinner in the middle east, and it’s always accompanied on the table during the fasting month Ramadan. Also it has become popular under the Western civilization who see it as an alternative protein source, and is used by Vegetarians and Veganer, and all who like to eat a light snack. – Wash the dirt off the beans and soak in water for a full night and drain. – Put the meat and the amount of water required in the pot on the fire and leave to boil. – Remove the fatty grease on the surface of the meat and leave the meat on the fire for half an hour. – Peel tomatoes and use its juice with the beans and add to meat. 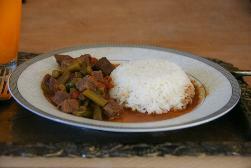 – Leave the mixture, tomatoes, beans and meat on fire for an hour or until cooked. – Crush garlic with salt. 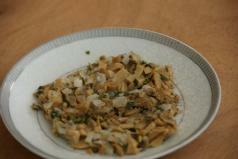 – Wash coriander and chop finely. – Fry coriander with garlic in margarine until tender. – Add Coriander and spices to the beans, then leave for another 5 minutes on fire. يضع اللحم و كمية الماء المطلوبة في طنجرة على النار و يترك حتى يغلي. يزال الزبد (الزفرة) عن سطح اللحم و يترك اللحم على النار مدة نصف ساعة. تقشر البندورة و تعصربطاحونة الخضار و تضاف مع الفاصوليا إلى اللحم. يترك خليط البندورة و الفاصوليا و اللحم على انار مدة ساعة أو حتى ينضج. تفرم الكزبرة و تغسلو تصفى. تقلى الكزبرة و الثوم في السمن حتى يذبل. تضاف الزبرة و التوابل إلى الفاصوليا و تحرك ثم تترك على النار مدة 5 دقائق. – Chop green pepper into small pieces after washing and add to olive oil over medium heat. – Meanwhile, peel tomatoes and grate finely. – Crush garlic with salt, coriander and cayenne pepper to a not so mashed well garlic mixture. 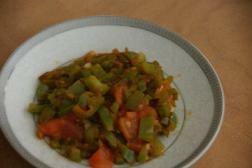 – After green peppers are tendered on fire, add the tomato pieces and stir until the tomatoes tender. – Add garlic mixture to the tomatoes and stir for another 3 minutes. يفرم الفلفل اﻷخضر قطعا صغيرة بعد غسله ويلوح بالزيت على نار متوسطة. – في هذه اﻷثناء تقشر البندورة و تفرم فرما ناعما. – يدق الثوم مع الملح و الكزبرة شرط أن لايهرس جيدا. – بعد أن يذبل الفلفل اﻷخضر على النار, تضاف إليه قطع البندورة ويحرك حتى تذبل البندورة. – يضاف خليط الثوم والكزبرة إلى البندورة وتحرك مدة 3 دقائق. – Put the water, garlic, onions, lemon juice, olive oil and a pinch of salt in a pan on fire. – Stir until boiling and then reduce the heat and leave the pan for 10 minutes on low fire. – Add mushrooms and parsley to the mixture and leave on fire for another ten minutes. – Drain the mushrooms and set aside on a plate. The liquid is placed in a pot and is to be boiled again until the quantity is about half a cup. – Pour the liquid over the mushrooms. Place the dish in the refrigerator and serve cold. – يوضع الماء , و الثوم , و البصل , و عصير اليمون و زيت الزيتون و قليل من الملح في مقلاة على النار. – يحرك المزيج حتى يغلي و عندها تخفف النار و تترك المقالاة مدة 10 دقائق على النار الخفيفة. – يضاف الفطر و البقدونس إلى الخليط و يترك على النار الخفيفة مدة عشرة دفائق أخرى. – يوضع الطبق في الثلاجة ويقدم باردا.